The Esslinger Zwiebelfest (translated: Esslingen Onion Festival) has been going on now for the past week, but with the Stuttgart Sommerfest and Thursday Street Food Market also in town, we've pushed this one back until this weekend. With our Saturday free, we decided to make the trip out for lunch. According to the festival's website, the event brings together eight onion farmers and celebrates an old story about an Esslingen woman who tricked the Devil. According to the story, the Devil asked the woman for an apple, but she recognized him despite his disguise because of his cloven hooves and sulfurous smell. Instead of an apple, she handed him an onion. When he bit into the onion and discovered the trick, he declared the inhabitants of the city would no longer be called Esslinger, but instead Zwiebeln or Zwieblinger (onions) as he left the city in a fit of rage. And this is why they celebrate the festival every year (since 1986). When we entered, we discovered that the festival was made up of eight different restaurants around the edges of the square with long dining tables in the middle. This was a bit contrary to my expectations which ranged somewhere between onion sculptures, costumed onion mascots, and booths with fried onion balls. The restaurants we saw were all quite nice and each boasted an impressive menu with largely traditional German dishes, including Flammkuchen (a kind of thin pizza), Zwiebelrostbraten (onion roast beef), Käsespätzle (cheesey pasta), and Fleischsalat (cold ham, pickle, and onion salad). I've already tried most of the German dishes that I saw and wasn't really craving beef or cheese, but I hadn't tried Zwiebelküchen (onion cake) before and was sure that's what I wanted. Each restaurant we passed offered it, and since I knew nothing otherwise about them, we finally chose one that also had an enticing Caesar salad on the menu. We sat down at a beer table at Brauhaus zum Schwanen and were almost immediately approached by one of the servers asking us if we wanted something to drink. We needed more time to look at the menu and asked him to come back. After a few minutes, he gladly returned, this time with a large red bowl of water for Leo, which we always appreciate. We were then ready to order. I decided to try a glass of the local Collegium Wirtemberg Grad 5 Weißweincuvée, which is one of their new summer blends. I was really pleased by the light, slightly sweet, fruity taste and bubbly feel of it. To eat, we ordered the Zwiebelkuchen, of course, as well as a Caesar salad for me and the Ratatouille for my husband. The Zwiebelkuchen came out first. The consistency was basically the same as a quiche. This one was light and fluffy, served slightly warm, and studded with small savory bits of ham and caraway seeds on the top. It was really very good, and definitely a dish that I would love to make at home sometime. My salad arrived a couple of minutes after that. The presentation was really nice, with shaved parmesan, freshly made croutons, cherry tomatoes, roasted chicken, and sliced baguette around the edges and a pile of sprouts on top of a mound of lightly dressed lettuce. The salad was light and fresh, though I have to admit the dressing was a bit bland. It tasted like the yogurt-based dressings that are common in Germany rather than the rich, salty, anchovy laden Caesar dressing that I'm used to in the States. Matt's ratatouille was similarly presented with four baguette slices around the edges and a small mound of sprouts on the top. I've seen ratatouille prepared many different ways; this one was made of big chucks of onions, tomatoes, peppers, eggplant, and zucchini in a tomato sauce. The vegetables were super fresh and the sauce was light and simple. Of the three dishes, the Zwiebelkuchen was my favorite. The other two were good, but I felt like I should have been eating more onion at an onion festival. I know that part of it was clearly the choices we made, but the food was classier than I expected (and somewhat expensive at 38€ for the three dishes and two drinks). I think I was expecting something a bit more like the Ludwigsburg Pumpkin Festival with its pumpkin-themed pasta dishes, soups, and fries from tiny pay-and-go stands. With this in mind, I probably won't go out of my way to go to the Zwiebelfest again next year, but if I were already in town with friends and wanted a good German meal, it would fit the bill. I will, however, be back to try Brauhaus zum Schwanen again. Though my Caesar salad was just okay (I am in Germany, after all), I was intrigued by a flyer at the table advertising them as Esslingen's only microbrewery. I would like to see what kind of beer they produce. I was also really pleased by our service, which was fast and attentive. Tomorrow is the last day of the Zwiebelfest for this year, and they're open from 11 am until 11 pm. Even if you can't make it, Esslingen is definitely worth a visit and easy to get to on the S1 towards Esslingen or on one of the regional trains. 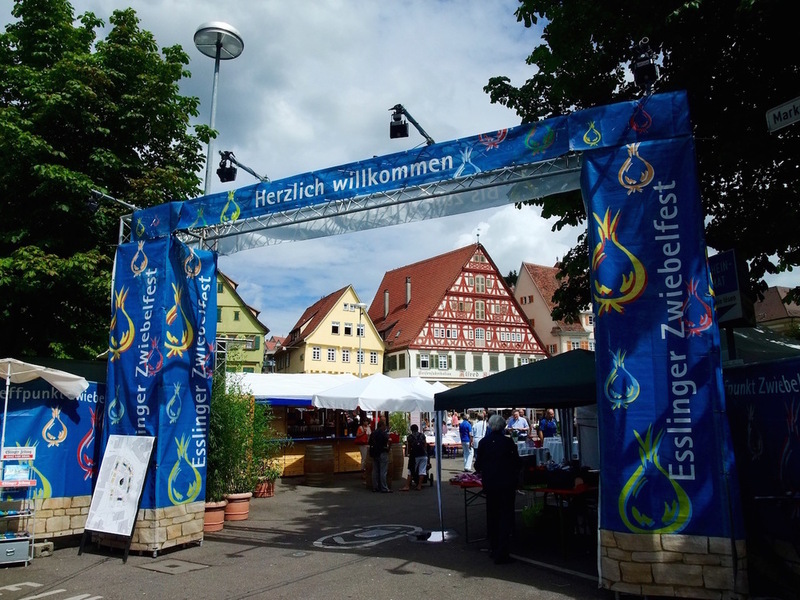 Have you been to the Esslinger Zwiebelfest? What was your impression?